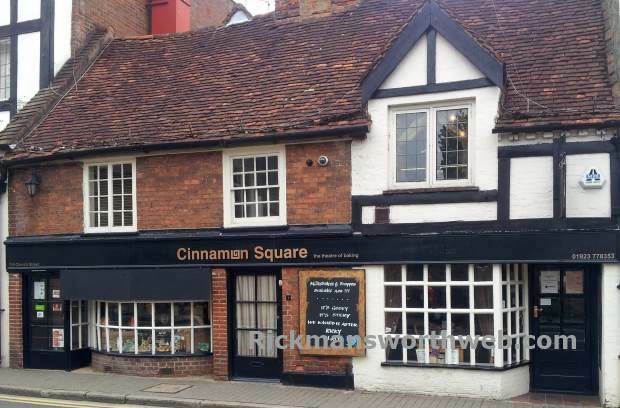 Cinnamon Square is an award winning bakery cafe based in Church Street, in a beautiful Grade II listed building. We make an exquisite selection of cakes and patisserie but our savoury range is equally ‘cin’sational! From gourmet tarts, full English breakfast to our Real Bread made the traditional way without the need of additives. Our coffee is organic & fair-trade and the loose leaf tea has been carefully selected for its aroma and fresh taste. Our signature product is the Great Taste Award winning Cinnamon Square Bun which is now being rivalled by the equally delicious Ricky Sticky Bun – named of course after our fabulous town Rickmansworth. We make celebration cakes for all occasions including sugarpaste, fresh cream and chocolate ganache cakes. We’re passionate about baking and love to share our knowledge and teach others through our courses and children’s birthday parties. We’re open 7 days a week, offer full table service, fully licensed and the staff provide a warm and friendly welcome.